You'll be £25.00 closer to your next £10.00 credit when you purchase Ambush. What's this? There are two images of warfare that dominate Greek history. The better known is that of Achilles, the Homeric hero skilled in face-to-face combat to the death. He is a warrior who is outraged by deception on the battlefield. The alternative model, equally Greek and also taken from Homeric epic, is Odysseus, 'the man of twists and turns' of THE ODYSSEY. To him, winning by stealth, surprise or deceit was acceptable. Greek warfare actually consists of many varieties of fighting. It is common for popular writers to assume that the hoplite phalanx was the only mode of warfare used by the Greeks. The fact is, however, that the use of spies, intelligence gathering, ambush, and surprise attacks at dawn or at night were also a part of Greek warfare, and while not the supreme method of defeating an enemy, such tactics always found their place in warfare when the opportunity or the correct terrain or opportunity presented itself. AMBUSH dispels both the modern and ancient prejudices against irregular warfare and provides a fresh look at the tactics of the ancient Greeks. 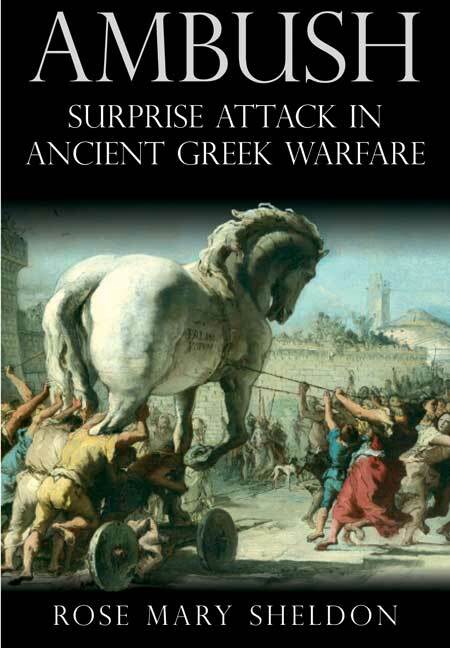 The author, an expert in intelligence history, has not only produced a lively and absorbing account of the use of stealth and deception, but also reviewed the traditonal view of Ancient Greek warfare and the way in which historians have developed the stereotype. This book will appeal to all those interested in Greek history and legend, but it should also appeal to a much wider audience because it has a strong relevance to modern insurgencies and, in particular, the situation in Afghanistan today. Colonel Sheldon is a Professor of History at the Virginia Military Institute. Her special field is intelligence history. She is on the editorial boards of the International Journal of Intelligence and Counterintelligence and Small Wars and Insurgencies. and has written dozens of articles on aspects of ancient intelligence, and has appeared frequently on TV and on National Public Radio. Her books include Spies in the Bible and Rome’s Wars in Parthia.